Campaign Intelligence, which provides aggregated metrics from all campaign webinars. This includes user profiles, lead sources, viewer activity and engagement scores. 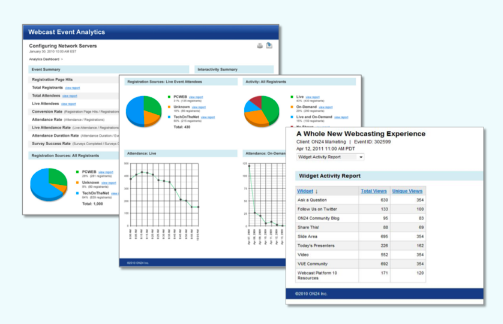 Event Intelligence, featuring more than 15 types of webinar metrics, including summary dashboards, registration conversion, content views and survey responses. Data is updated in real time. Webinar Benchmarking, which provides data from ON24’s database to enable users to compare webcast performance to averages across a target segment. ON24 Integration Service, which includes support from CRM and marketing automation platforms, such as Salesforce, Microsoft CRM, NetSuite, Eloqua and HubSpot. More than 30 types of metrics can be transferred and compiled to streamline the lead-scoring and nurturing process. "With more than 732 hours of content delivered every hour, ON24 is leading the charge in the business of hosting live webinars,” said Sharat Sharan, CEO and Co-Founder of ON24, in a statement. “ON24 Intelligence will combine everything our customers love and expect from ON24, with a streamlined user interface and all-inclusive analytics package."